Yet again I need to apologise for the scarcity of newsletters this past year. Your newsletter editors have found other commitments getting in the way of this publication. We hope the news and comment in this issue will bring you up to date with what has been happening – and you will be able to participate in our forthcoming events. THE 2004 ANNUAL GENERAL MEETING! On Thursday 8 July 2004 the AGM of the Friends of the Dorothy Neal White Collection will be held at 5.30pm in the Auditorium at the National Library. The evening will begin in the traditional way with drinks, nibbles and chat. The meeting will follow at 6pm and will include the election of officers. Our President, Tania Connelly, has resigned from the position due to pressure of other commitments (though she will stay on the committee) so we are again looking for someone to fill this role. If any members are interested in being on the committee, being an office holder, or have any issues they would like to have included on the agenda please let Kerry Fryer know by 1 July 2004 (see contact details on page 17). See also a proposal from Trevor Mowbray to be considered at the meeting, on page 2. Following the AGM the Children’s Literature research librarian, Lynne Jackett, will give us an illustrated talk about her overseas travels and recent project work on the collections. It is generally known that the Dorothy Neal White Collection includes books published up to 1940. 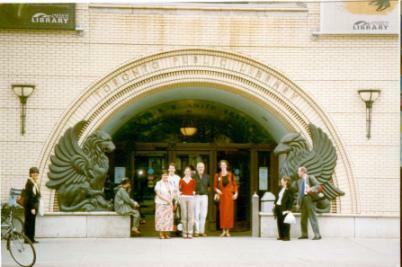 That cut-off date was selected as the School Library Service began collecting books early in the 1940s and a copy of each book that was selected for the Service was held for what became the National Children’s Collection based in the National Library. A collection of other titles published in the nineteen-forties that might have been read by New Zealand children has been held in the National Library collection awaiting the time that a decision might be made about the boundaries of the DNW Collection. It was assumed at one point that maybe the books of the decade of the nineteen-forties would be gathered into the DNW Collection and the scope of the collection would be extended to cover this period. Possibly this would happen every decade into the unforeseeable future. However, when the circumstances were looked into, two things became apparent. One was that the National Children’s Collection that might have been threatened with the knife of administrative economy is now regarded as having a certain future and a place in the children’s literature research section of the library. The other is that to change the nature of the DNW Collection and add to it whole categories of stock is not an easy matter as it is a heritage collection within the library. Since the founding of the collection there has also been the very generous donation to the National Library of the Susan Price Collection of children’s books of the twentieth century. So we have the situation where there are three collections of historical children’s books within the ambit of the National Library but only one of them has a supporting society of Friends. The three collections are under the oversight of one person, the Research Librarian (currently Lynne Jackett), and are seen as together providing a very strong base for research into New Zealand children’s reading interests. One solution that might occur to people would be to amalgamate all three collections in one. This would not only be technically difficult but also confusing and destructive so few would support that idea. Another solution would be to form two other support societies for the two remaining collections. This would really mean that the members of the DNW Friends who would form the group most likely to have an interest in doing this would have to shoulder two other burdens of incorporated society management. Not likely to be considered practicable. The question then becomes, can the Dorothy Neal White Society extend itself to offer the same support and protection to the other two collections? The name of the Society could be altered and the constitution could be amended to highlight the extended scope. However I doubt if the members would appreciate a change to the long and fairly cumbersome name of the society to incorporate anything else and the present name has a more than twenty- year history. A change to the constitution would be controversial, time consuming and definitely expensive. So what do we see when we look at the constitution in detail? As a practical example of how we interpreted this constitution, you can look up the conditions for the Dorothy Neal White Scholarship where we required that the scholar make use of the collection for research purposes but we also mentioned the other collections as likely to play a part in research. It seems to me that we could state our claim to be a support society for the other two collections, or for that matter, any children’s books within the National Library including those held in the Alexander Turnbull Library, without going beyond the limits of the objects stated in our constitution. We could pass a resolution at the AGM to the effect that we support the children’s literature research unit of the National Library and all collections associated with it. We could support, focus attention, encourage scholarly interest and sponsor publication without regard to barriers of date. If we took up such a position we would of course have to negotiate with the owners of the present collections, the National Library and Susan Price. But what do you, the members of the Society, think of this idea? Come to the AGM prepared to discuss it, or if you cannot come send an e-mail to the secretary, or a letter with your ideas (see contact details on page 17). 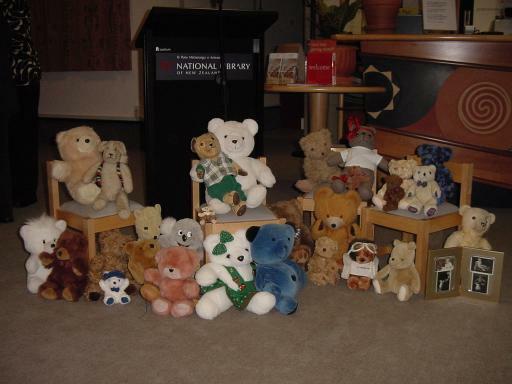 A successful AGM was held on 3 September 2003 at the National Library. As usual the evening began with drinks and nibbles. Lynne Jackett chaired the meeting and following the usual reports the election of officers was held. We were delighted that Tania Connelly accepted the position of President, and 2002 Scholarship winner, Emma MacDonald, joined the committee. Other office holders and committee members agreed to retain their positions. Emma then gave an interesting report on the research project she completed as the 2002 DNW Scholarship winner. She looked at how females were represented in fiction for children 1840 to 1940 – the archetypes and stereotypes. Her research covered 44 books, not just New Zealand titles, looking at the authoritative figure, the mother figure and the crone. Of these 44 books strong and good role models were revealed in only three titles, the rest demonstrated weak and passive figures. Emma suggested it would be interesting to continue this research from 1940 until the present day. A lively discussion followed Emma’s report. Following the meeting Susan Price gave a fascinating talk, Both artist and author, about a group of her favourite twentieth century writers (a full account is given on page 13). We are delighted to announce that the 2003 Friends of the Dorothy Neal White Scholarship has been awarded to Caroline Campbell. Caroline is completing a PhD in English at Victoria University. She is using the Dorothy Neal White Collection to research the usage and design of illustration in junior fiction in New Zealand from 1890-1920, and its impact on the formation of a national identity at a time when New Zealand, while still a colony, was establishing its own seminal persona as separate and distinct from Australia. 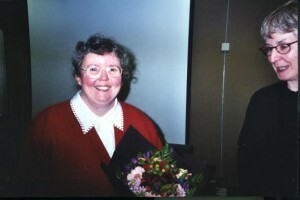 We celebrated the award of the Scholarship to Caroline at our event on 12 February 2004. For details see below. On Thursday 12 of February 2004 the Friends celebrated an early Valentine’s Day among pink and white balloons, streamers, hearts and stars. Even some of the food had a pink and white theme – and was more delicious than that may sound! The formal part of the evening began with the National Librarian, Penny Carnaby, presenting the 2003 Scholarship to Caroline Campbell. 1942 Seventeenth summer: the magic and wonder of first love by Maureen Daly – read by Alison Grant – the first time the young man is invited to dinner it is disastrous! The audience departed, humming “A fine romance …”! A successful New Zealand Post Book Awards for Children & Young Adults’ Festival reached a climax on 13 May 2004 with the annual book awards. These awards promote excellence in children’s and young adults’ literature and provide recognition for the very best New Zealand books for children and teenagers published each year. This year the awards new name – with the addition of “young adults” was used for the first time. The ceremony, a late afternoon one (4.30pm), was again held in the Legislative Council Chamber at Parliament Buildings, with the Hon Judith Tizard, Associate Minister for Arts, as hostess. She was accompanied by the Rt Hon Jonathan Hunt, Speaker of the House of Representatives. Judith Tizard welcomed the guests, warmly thanking all those involved in making the Awards so successful. She spoke enthusiastically about the importance of books and reading for children and was pleased to learn that children still do read despite the diversions of other media. She reminded her audience that New Zealand music was celebrated by a New Zealand Music Month and expressed the wish that in time there could be a similar New Zealand Book Month. Broadcaster and gardening guru Maggie Barry acted as a skilful Mistress of Ceremonies building up a feeling of anticipation as the ceremony proceeded. She introduced John Allen, CEO of New Zealand Post, sponsor of the Awards. He spoke very knowledgeably of the short-listed books and of his Company’s pleasure at being involved, for the eighteenth year, in the promotion of books and reading, stressing the importance of the letter as a form of communication. 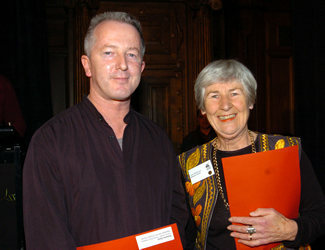 He was followed by Linda Henderson, CEO of Booksellers New Zealand who administer the awards and the festival. She also spoke warmly about the Association’s part in encouraging New Zealand writers and publishers in establishing a specifically New Zealand literature for children and young adults. Thanks were extended to the committee members and the judges for their work and to New Zealand Post, Creative New Zealand and Booksellers Tokens for their support. There were 114 entries this year, 31 in the non-fiction category, 40 in the picture book category, 28 in the junior fiction category and 15 in the young adult fiction category. From this selection five books were short-listed in each category and one of these selected as the winner of each. An Honour Award was also made in the picture book category. The overall winner – The New Zealand Post Book of the Year – was chosen from the four category winners. Judges thanked Reed Publishing for their continued service to New Zealand children’s non-fiction and praised Reed and Huia Publishing for publishing an increasing number of books in Te Reo Māori. Longacre Press was also congratulated for their excellence in book design and their commitment to fiction for young people. 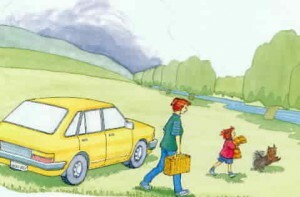 Three of the five short-listed picture books were published in Australia and the judges felt that the quality of their book design and production was a challenge to New Zealand publishers. They also pointed out that writing for boys was strong this year. The high point of the afternoon was, of course, the announcement of the winners. In the Picture Book category the judges, after much discussion, decided to make an Honour Award to Napoleon and the chicken farmer, written by Lloyd Jones, illustrated by Graeme Gash and published by Mallinson Rendel. They wanted to recognise the exceptional quality of the illustrations and Lloyd Jones’ skilful text in a book that works as much for adults as it does for children. Children themselves decided the Children’s Choice category. There were 31,000 votes cast for this award. The formal part of the ceremony over, the ward winners were whisked away for interviews by the media while other guests gathered in the Grand Hall for drinks and nibbles. The choir from Rata Street School entertained with a group of cheerful songs. Children from this school had also done an excellent job of presenting bouquets of flowers to the award winners. There was time to meet old friends and to reminisce, to congratulate winners and to look at the books. A very enjoyable occasion. Below is a full list of the finalists in each category with the winners in bold. On 19 June 2004 for the first time Wellington children will have the chance to participate in the Storylines Festival free family day that their Auckland counterparts have been enjoying for the past ten years. The Festival is organised by the Children’s Literature Foundation of New Zealand. From 10am to 3pm an exciting and varied programme will be offered at the Westpac St James Theatre. In the main auditorium authors such as Lynley Dodd, Fleur Beale and Joy Cowley will be reading their stories. There will be an Illustrators’ Gallery on Level 1 where Fifi Colston, Bob Kerr, Christine Ross, Ali Teo and Ruth Paul will be in action. Two books will be launched during the day – The biggest number in the universe by Julie Leibrich (winner of the Joy Cowley Award) will be launched by Scholastic at 12.30pm, and then Harper Collins will launch Joy Cowley’s own Wild West hullabaloo at 2.30. In addition visitors will be able to watch the Royal New Zealand Ballet dancers rehearse between 10.30 & 11.30, and get a sneak preview of the July holiday musical based on the book Napoleon and the chicken farmer starring Jackie Clark. There will be bookstalls, face painting and competitions, even a “Grandparents resting area” and cafe – entertainment for the whole family! As part of 11th Storylines Festival a children’s’ literature seminar was held at the Westpac St James Theatre on Tuesday 15 June 2004. The theme was “Fantasy: the crossover genre” and featured Australian author, Garth Nix, and New Zealand writer Sherryl Jordan. They were joined by Agnes Nieuwenhuizen, Director of the Australian Centre for Youth Literature, State Library of Victoria. Joanne Black, Assistant Editor of the Dominion Post, chaired the panel. Each of the speakers explored the concept of the categorisation of books by age and / or genre, relating this to their own work. After the presentations the panel took questions from the audience and a lively discussion followed. A fuller account of this interesting and informative evening will be included in our next newsletter. Following a second successful foray into virtual bookshops across Britain, Australia and the USA, we are now seeking only one title from the original New Zealand desiderata list : A Christmas cake in four quarters by Lady Barker, first published in 1871. The boy colonists / Rev E Simeon Elwell. Christchurch: Capper Press, 1975, facsim 1878 ed. The recent focus of conservation activities has been on providing improved enclosures for fragile books that were previously sealed into plastic bags. Last year Vasaré Rastonis, the National Library book conservator, implemented a programme to repair dust jackets and provide mylar protective covers for them. In addition, all of the flimsy serials (for example, the Whitcombe’s Story Books) were re-housed in sturdier boxes. Vasaré also rebound a small number of books. Sadly, Vasaré has now returned to live in Chicago. The teddy bear display was replaced by “The Susan Price Collection”. Susan selected a number of books to demonstrate the scope of her collection and the display has been popular, with people entering the reading room often diverting to study it. An illustrated talk on the National Library of New Zealand’s three children’s literature collections was included in the “Circling the Globe: international collections of children’s literature” session of the combined American and Canadian Library Association Conference in Toronto, Canada, in June 2003. At the same conference I hosted a poster session on the Dorothy Neal White Collection cataloguing and conservation projects. A personal highlight was meeting three-time Caldecott Honor Medallist Jerry Pinkey (see photo on the front page) whose fine illustrations I have admired since first encountering them in the 1970s. Jerry signed and drew a fox and an ark on my copies of Aesop’s fables and Noah’s Ark. In March 2004 I presented an extended version of the “Circling the Globe” talk to the South Island Children’s Librarians Workshop in Dunedin and was very gratified to be asked to repeat the presentation to the Aoraki Branch of LIANZA’s inaugural weekend school held in Geraldine in May. We were delighted to see that Friend’s member Beverley Randell Price became a Member of the New Zealand Order of Merit for her services to children’s literature and education in the Queen’s Birthday Honours List. In addition author William Taylor, was awarded Officer of the New Zealand Order of Merit. Congratulations to both recipients for this recognition. 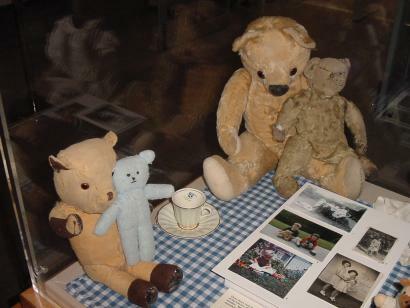 Our meeting on 1 May 2003 celebrated 100 years of teddy bear history with a party for members’ bears, their owners and friends. Committee members Lynne Jackett, Joan McCracken, Audrey Cooper, and Kerry Fryer read from favourite bear books, and Tania Connelly told a delightful and moving story of her mother and her bear Goldie (they featured in our last newsletter). The accompanying display of much-loved teddy bears and books from the Collection even featured in an international magazine, Teddy Bear scene, in August 2003. Articles on the display were also published in the Dominion Post and the Hutt News. Front – Teddy (1954), given to Joan McCracken when she was born, holding Blue Ted, the bear of her son James Dee (b.1978). The National Librarian, Penny Carnaby, was a special guest at the meeting and presented Emma MacDonald with the 2002 Friends of the Dorothy Neal White Collection Scholarship. In addition to being the winner of the Picture Book Award at the NZ Post Awards for Children & Young Adults 2004, Auckland writer-illustrator Pamela Allen was also the 2004 recipient of New Zealand’s most prestigious award for children’s literature, the Margaret Mahy Medal. The medal and lecture award is given annually by Storylines: Children’s Literature Foundation of New Zealand for a distinguished contribution to children’s literature and literacy. Over a prolific 25-year career, Pamela Allen’s books have become widely loved by New Zealand and Australian families and published also in Britain, America, Japan, Denmark, Sweden, Norway, France, Spain and Korea. A New Zealander based for many years in Australia, now returned to New Zealand, Pamela Allen has won numerous awards on both sides of the Tasman for her highly original picture books, including Who Sank the Boat?, My Cat Maisie, Bertie and the Bear and more recently the Mr McGee series. 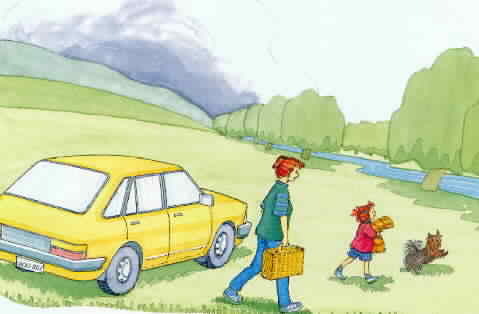 Her most recent picture books are Cuthbert’s Babies and Grandpa and Thomas. Previous winners of the Margaret Mahy Medal include writers Joy Cowley, Sherryl Jordan, Maurice Gee and William Taylor, illustrators Lynley Dodd and Gavin Bishop and publisher Ann Mallinson. Pamela Allen’s lecture was presented at the annual Margaret Mahy Day of CLFNZ, held on Saturday, 13 March 2004 at the Auckland College of Education. INTERNET SITEWe are considering setting up an independent website for the Friends of the Dorothy Neal White Collection. Full details of the proposal will be given at the AGM. Suggestions for content will be welcomed. JOAN REID 1912 – 2003Joan was a loyal and long-standing member of the Friends. She attended meetings regularly until her late 80s when she suffered increasingly from ill-health and could no longer lead what had been a busy and stimulating life. Joan Margaret Airey was born in Auckland and spent most of her youth on the North Shore. After graduating with an M.A. in English from Auckland University she worked for a time in Broadcasting under James Shelley before leaving to take up secondary school teaching. She taught mainly at Solway College in Masterton. Following Joan’s marriage to Russell Reid, the couple ran a lighting and equipment business which included setting up lighting boards in theatres. The Reids also hired out plays. 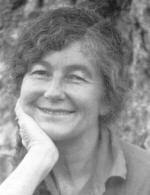 In 1966 Joan won a lectureship at the Kindergarten Teachers’ College (then situated in Tinakori Road and afterwards in the Glen, Kelburn). Nine years later the Kindergarten College was incorporated into Wellington Teacher’s College as the Department of Early Childhood Education and Joan joined the lecturing staff there. Staff cuts in the early 1980s meant that several lecturers had to go and Joan was one who elected to take voluntary retirement. The writer well remembers the deadpan skill with which Joan and her departing colleagues danced the Redundancy Tango. Their performance brought the house down. After her retirement Joan was even more involved in thespian affairs and she appeared in several television dramas as well as featuring in some memorable ads. She continued her activities in such associations as the Federation of University Women and, of course, the Friends of the Dorothy Neal White Collection Society. Long time members will surely remember her address to the Society in August 1991. In this talk, entitled Books tasted, chewed and digested: a childhood experience, she spoke to an appreciative audience about her favourite childhood reading and its influence on her life. Of special interest were her comments about Edith Howes, the focus of Books-Notes-Authors 4, by Celia Dunlop, launched that same evening. Mother, grandmother, teacher, popular landlady of a legion of Library School students, actress, broadcaster, booklover and entertaining companion, Joan is much missed by her family and friends. We extend our sympathy to her daughter, Susan, and the family. BOTH ARTIST AND AUTHORSusan Price’s extensive collection of twentieth century books for children, and her exceptional knowledge of the writers and illustrators who create them, meant that she had difficulty in deciding what her focus would be for this talk. She decided to start with some of her favourite words – and then to make a sub-set of particularly talented illustrators. Susan spoke of the difference between illustrators and painters – the former, she noted, need to have great versatility to be able to render figures, animals, landscape, architecture and still-life equally well. 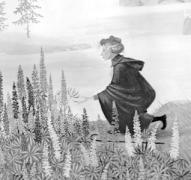 The first of the writers / illustrators about whom Susan spoke was Marguerite de Angeli who was born in Canada in 1889 and died in America in 1987. 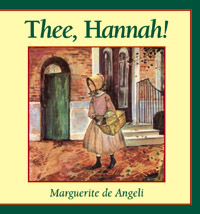 In her books de Angeli wrote about different people and their cultures – in Elin’s Amerika (1941), for example, the protagonist is Swedish; in Petite Suzanne (1937) she is French Canadian, and in Susan’s personal favourite Thee, Hannah! (1940) she belongs to the Quaker community. De Angeli won the 1950 Newbery Medal for The door in the wall. Of particular note are de Angeli’s illustrations. Susan talked us through the difficult and complex lithographic process that the artist used requiring that the pictures had to all be drawn in reverse and then put through a four-colour separation process. Susan’s second subject was also a Carnegie Medal winner. Cynthia Harnett was born in London in 1893 and died in 1981. She studied at the Chelsea School of Art under her older cousin Vernon Stokes, with whom, in the early 1940s she produced several large picture books. In 1949 she published The great house the first of six books set in medieval England. It is the meticulous detail of the period that Cynthia Harnett puts into both the words and the pictures that particularly appeal to Susan. Joyce Lancaster Brisley (1896-1978) was one of a trio of talented sisters who all had works accepted for the 1919 exhibition at the Royal Academy. In 1925 Brisley’s best known creation, Milly-Molly-Mandy first appeared in the Christian Science Monitor. Three years later the first of six books about her appeared. Susan pointed out that in each chapter Milly-Molly-Mandy learns something new there is always a sense of accomplishment. The feeling of familiarity is strong in the books with Brisley having given the family’s cottage the typical features of its time and with the map of the village an essential part of each book. And of course the books include Milly-Molly-Mandy’s “little friend Susan”! Edgar and Ingri Parin D’Aulaire met at art school in Germany. They lived in Norway before moving to the USA in 1929. Like Marguerite de Angeli they used the lithographic process to great effect. Their striking books The children of the northlights (1935), George Washington (1936), and Abraham Lincoln (1939) are among Susan’s favourites. Born in Budapest in 1899 Kate Sendry emigrated to the United States in 1922. In the 1930s and 1940s she published a series of fine novels with strong characterisation. Of particular note are The good master (1935), the 1938 Newbery Medal winner The white stag, A tree for Peter (1941) and The open gate (1943). Susan spoke with particular warmth of The singing tree (1939), the sequel to The good master, which is set in World War I and which has a strong anti-war message. Seredy died in 1975. With a Dutch father and an Irish mother Hilda Van Stockum (born 1908) made the most of her interesting heritage in her writing. She grew up in Dublin but moved to the United States in 1932. Drawing on her background she set The cottage at Bantry Bay (1938) in Ireland and Kirsty and St Nicholas (1940) in Holland. Also set in Holland – in World War II – The winged watchman (1962) is such a timeless book that Susan still gives it to children to read. British author C Walter Hodges was born in 1909. He studied art in London and his passion for the theatre led him to become a world authority on the Elizabethan theatre. This expertise is shown in two of his books Shakespeare and the players (1948) and Shakespeare’s theatre (1964). Susan particularly recommended The overland launch, based on a true story of a dramatic rescue by the Lynmouth lifeboat crew in 1899. Robert McCloskey (1914 1969) studied at the Boston School of Arts and his watercolour illustrations are notable for their accuracy and their fun! He wrote about small town America (after World War II he settled in Maine), drawing on his local community, and even his family, for his books. He was the first illustrator to twice win the Caldecott Medal in 1942 for Make way for ducklings and in 1988 for Time of wonder (one of the stories in which his daughters, Sally and Jane, feature). Lentil (1940) is another of his titles Susan selected for special mention. 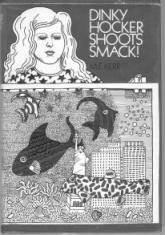 The final author / illustrator about whom Susan spoke was Barbara Cooney (1917-2000). Her illustrations are stylised and slightly naïve and she mixed colour and black & white pages in her publications to great effect. Her books explore three main themes become independent and self-aware, leave the world a better place, and life is a journey from childhood to old age. 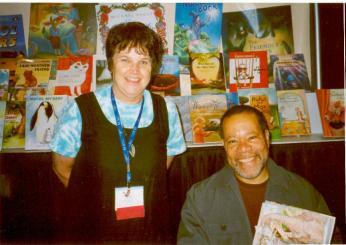 In 1959 Cooney won the Caldecott medal with the classic Chanticleer and the fox. She published Miss Rumphius in 1982 (a story with a librarian as the protagonist and the most gorgeous lupins), and Island boy in 1988 – a book which Susan described as having a lyrical beauty as it follows life from childhood to a funeral.Whether renewing acquaintanceships with long-time favourites, or discovering new treasures, it was a delight for the audience to share in Susan’s knowledge and her enthusiasm for the books about which she spoke. We do hope she will return to share more favourites with us on another occasion. A reminder to Friends that the following publications are available to members. All these publications will be available at our next function – or by writing to the Society at PO Box 12499, Wellington. PO Box 12 499, Wellington. The 2003 Annual General Meeting agreed to hold the subscription rate at $20 a year. It was also suggested that members might also like to make a contribution to a special Scholarship fund that will allow us to continue and / or increase the amount we are able to offer a student doing research based on the DNW Collection. A separate line has been included on the form for those Friends who would like to make such a donation.